When it comes to grain bowls I’m all about loading them up with a mix of veggies (cooked and raw) and tossing everything with a flavorful dressing or sauce. Seriously, it’s all about the sauce when it comes to “our” grain bowl success at Tumbleweed Farm. This particular grain bowl is a lovely combination of flavors and textures. 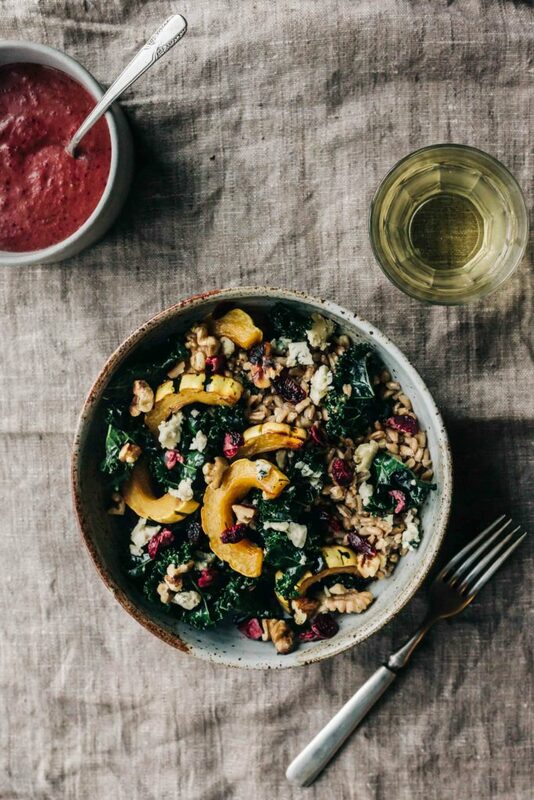 We loaded our bowls with chewy farro, tender roasted delicata squash, kale, crumbled blue cheese, toasted walnuts and dried cranberries. We then tossed everything in a tangy cranberry dressing that definitely stole the show! I love cranberry season and this dressing is as festive as it gets. I’m thinking it would be great on an apple and celery salad or even tossed with some raw (very thinly sliced) fennel and kohlrabi. Heck I bet it’d be great drizzled over your morning oatmeal with some fruit and toasted nuts. Go wild! With this recipe you can swap out the farro for another grain like quinoa or rice. However, I’d definitely encourage the farro because its texture is delightful and it has a mild nutty flavor that I absolutely adore. Love this one! It’s something so satisfying + healthy in the midst of complete carb overload season. Why so much olive oil for the dressing? Thx! This dressing benefits from the 1 cup of oil to balance out the vinegar and tart cranberries. The ratio works but feel free to add less. I personally love the consistency and flavor of the proportions here. As always, use the recipe as a guide and adjust to your preference. Happy cooking! This was wonderful! The dressing was a hit. Thanks for a great recipe. Made this for dinner last night. Excellent! Thanks so much for your great website and cookbook. Found the delicata squash´s skin was a little rough after the oven. Is that normal? you’re squash may have been old and therefor the skins more tough. That’s the only thing I can think of. Hope it still tasted good. Made this tonight, served alongside steak. I used butternut squash since I love it and couldn’t find delicata. Used pecans since that is always my nut of choice, and goat cheese since hubby is not a blue cheese fan. Also used much less olive oil in the dressing- 1/2 cup plus 1 Tbsp (since noticing other comments about the amount). I also added all the dressing to the salad so I could mix it more thoroughly. Amounts for the squash and kale are vague, so use more of what you like. I liked this a lot, will definitely make it again!